Dolly bow bow, I'm guessing you've all heard of it right? Well, if you haven't I'm guessing you're new to the internet or something! Dolly bow bow is a cute, girly, kitsch and basically all round pretty website and webstore run by blogger and youtuber extraordinaire Kate Murnane! I first stumbled upon Kate's YouTube channel probably around 4 years ago now and I immediately got hooked on watching her Primark hauls and favourites videos plus I'm not going to lie.... had some major hair envy going on! This girl loves shopping and has a fab sense of style so everytime I watched her videos I had mental wishlists so long they were coming out of my ears! Since starting my own blog, moving out, working full-time etcetc my time for 'YouTube watching' seems to have dramatically decreased (I can no longer have 'watch the shaytards new video' in my morning routine boooo) but I always make sure I try and catch Kate's videos when she uploads them and her past few have been super heart-warming and sweet as she's had gorgeous baby Archie! Anyway I've totally digressed there! I've always been a fan of Kate's website of the same title - Dolly Bow Bow, making a few orders over the last few years and after not visiting it for a while I decided to have a cheeky look this week after spotting Kate rocking a gorgeous necklace and I fell in love with so much on there! So here's a little Wishlist of those bits I've been eying up, make sure you go on over and have a look for yourself and don't forget to check out Dolly Bow Bow's YouTube and blog, you won't regret it! Those are some super cute items! I love the headband! The dainty little ring is so cute! The Evie statement necklace is a beauty! I had no idea she had a shop. But I do love that floral crown, despite not having anywhere to wear it! I love Dolly Bow Bow! Haven't been on her website for a while though, will pop over now! The necklace at the top right is just beautiful, it's very unique! Those designs are so cute - I love the double heart necklace!!! I love Dolly Bow Bow! i found Kate's channel just about a year ago and she's one of the very few youtubers I'm always checking back on, I can't get enough of the jewellery. 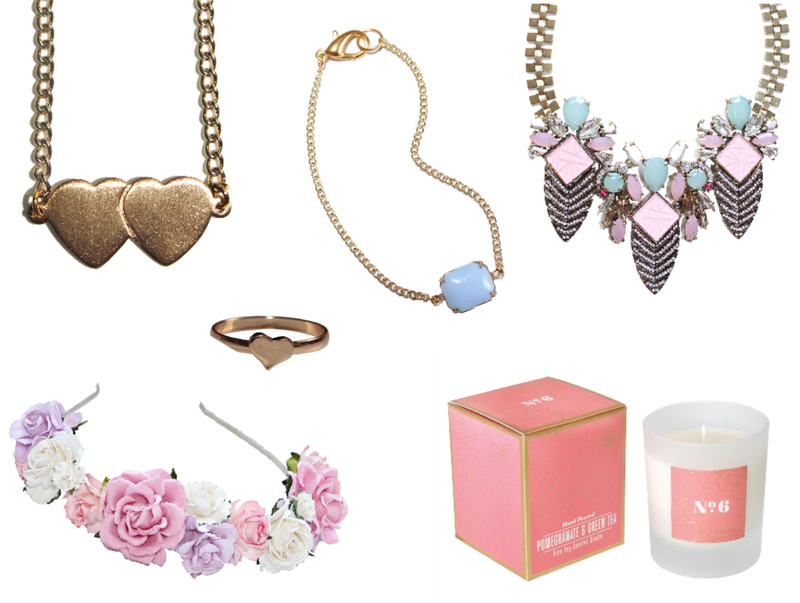 My favourite piece there has to be the double heart necklace, but if I could stock up on all things DBB I would! I love that necklace with the blue pendant it's such a great find!! your blog is so gorgeous and girly, I love it. I love the name and header.